Carmona, J.; Cortadella, J.; Kishinevsky, M.
The theory of regions was introduced in the early nineties as a method to bridge state and event-based models. This paper tackles the problem of deriving a Petri net from a state-based model, using the theory of regions. Some of the restrictions required in the traditional approach are dropped in this paper, together with significant extensions that make the approach applicable in new scenarios. One of these scenarios is Process Mining, where accepting (discovering) additional behavior in the synthesized Petri net is sometimes valued. The algorithmic emphasis used in this paper contributes to the demystification of the theory of regions as been only a good theoretical exercise, opening the door for its application in the industrial domain. 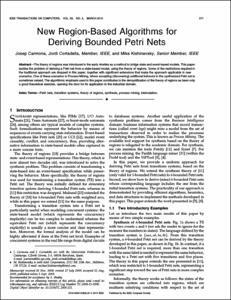 Carmona, J., Cortadella, J., Kishinevsky, M. New region-based algorithms for deriving bounded Petri nets. "IEEE transactions on computers", Març 2010, vol. 59, núm. 3, p. 371-384.